Leave Athens with us and explore the Saronic Gulf! Poros, Hydra and Aegina are waiting for you! Come to these natural paradises and discover their traditional life style! Discover the Saronic Gulf! 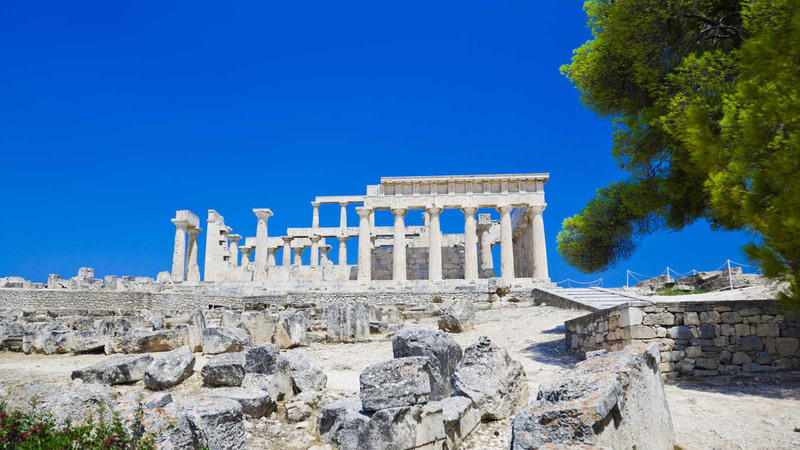 Join our Cruise and visit its three main islands: Poros, Hydra, and Aegina. We will depart from the Port of Piraeus, where you will receive a warm welcome from our staff. On board, our live orchestra will put you in the right mood with some international classics. POROS - Our first stop will be Poros, the smallest of the three islands, and it will take just two hours to reach it. We will stay in Poros for about 50 minutes, and you have some free time to walk around and enjoy the Poros Town. Then we will come back to the ship and have a traditional lunch on board. HYDRA - Just one hour and 15 minutes late, we will be in the port of Hydra. This island comes with an amphitheater shape that was loved by Saronic Pirates because they can hide so well from authorities and enemies. You will be enchanted by Hydra’s small narrow stone-paved streets and its characteristic “vehicle”, used by locals and tourists: a saddled donkey! We will spend one hour and a half in this picturesque town where humans and nature go along so well. Once we come back on board, we will have a second tasting session, with some typical products. AEGINA - This island is the larges one, therefore, you have three different options to visit it! 1) Guided Bus Tour: Our local passionate guide will tell you everything about the island and its archeological site. You will visit the Temple of Aphaia, the best-preserved temple in Greece by far. This temple forms the famous “Sacred Triangle” with the Temple of Poseidon and the Parthenon. It is built on the top of the hill and offers breathtaking views over the Saronic Gulf. 2) Panoramic Bus Tour: This tour gives you the opportunity to drive across the whole island but without the visit to the archeological city. This is your tour if you are more into nature than history. We will end our trip drinking a glass of Ouzo by the sea, along with a selection of delicious Greek “Mezedes”. 3) Free time: And your last tour option is no tour at all! You can enjoy your time strolling around the island, maybe trying a traditional horse-carriage ride around the town or just walking at your own pace. -Please be aware that some walking is included during this tour, please come prepared and we recommend wearing comfortable clothes and shoes. -Please arrive at the meeting point 10 minutes before the start of the tour. -One day cruise departs from Trokadero port at 08:00. The order in which we shall visit the islands is either Poros - Hydra - Aegina or Aegina - Poros - Hydra which does not change the duration of stay on any of the islands.